Cal Lynch travels back in time to 15th-century Spain through a revolutionary technology that unlocks the genetic memories contained in his DNA. There, he lives out the experiences of Aguilar de Nerha, a distant relative who’s also a member of the Assassins, a secret society that fights to protect friends. The member of the Assassins, a secret society that fights to protect free will from the power-hungry Templar Order. Transformed by the past, Cal begins to gain the knowledge and physical skills necessary to battle the oppressive organization in the present. First all very disappointed this film why so disappointed i expact more of film when watching this flim totally boring 2 half hours beside i big game franchise . Hopeful lot actions in film andl ot killing there was not lot in films. There bad music in this film special song end movie . Director Justin Kurzel did use mostly elements from the video game in to live action and good thing about films Michael Fassbender was good playing character Cal Lynch in movie . Overall very disappointed films too problem in movie hope better from action sequence in the movie . This movie reviews Director bye Justin Kurzel starting Michael Fassbender Jeremy Iron and Marion Cotillard. 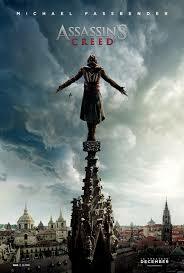 This entry was posted in ACTION, ACTION/DRAMA, actor movie review, Assassin creed by Movie talk news with Antonio Gutierrez. Bookmark the permalink.